Formula feeding is an attractive option for mothers who can't or choose not to breastfeed. A simple rule of thumb when pondering how much formula to feed your infant is that newborns and young babies are fed on demand, says the American Academy of Family Physicians. Achieving the right frequency of bottle feedings, rather than exact amount of formula intake, ensures your baby gets the nutrition he needs. According to the AAFP, most babies consume 2.5 oz. of formula per pound of body weight daily. For example, a 7-pound baby may drink 17.5 oz. of formula. This only an estimate, however. Newborns are fed as needed, which can be anywhere between eight to 12 times a day, decreasing in frequency as your baby grows. 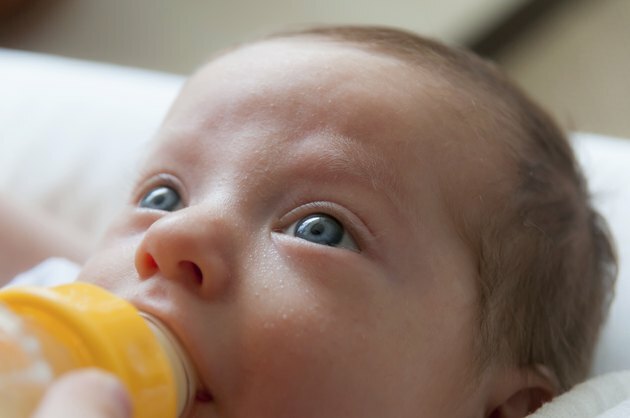 Bottle-fed newborns may drink 2 to 3 oz. of formula, on average, every two to four hours, says the Nemours Foundation. Your newborn baby should never go for more than four hours without a feeding. Your baby goes through growth spurts, which also predict how frequently he'll want the bottle, says the AAFP. These generally take place at around two and six weeks of age and then again at around three and six months. Feeding frequency decreases, but your infant's formula intake during a single feeding may increase to around 6 to 8 oz., says the National Institutes of Health. Infants between the age of four and six months are usually ready to be fed supplemental cereals, but should still receive between 28 to 45 oz. of formula each day. If you worry that your child isn't getting enough formula, there are other signs that you can look for to put your mind at ease. The AAFP states that your infant is well-fed if she consistently gains weight three to seven days after birth, wets between six and eight diapers each day and has two to five daily bowel movements. Bowel movements typically decrease to two a day as your baby grows. Your baby will appear content and satisfied after each bottle feeding. Baby formula comes in three forms—ready-to-feed, concentrated and powdered—says the American Academy of Pediatrics. Ready-to-feed formulas provide the greatest ease of use but are more expensive. Powdered formulas, the least expensive option, involve mixing one scoop of formula to every 2 oz. of water. Liquid concentrates are prepared by mixing equal amounts of water and formula. For example, for every 2 oz. of liquid concentrate, 2 oz. of water is added. Liquid concentrate and powdered formula can be prepared in larger batches and refrigerated to last the entire day, or in the case of powdered formula, up to 48 hours, says the AAP. Your baby's doctor will tell you how much formula you can expect to feed your new baby, says the AAFP. Most doctors recommend modified cow's milk formula that's fortified with iron, but if your infant exhibits signs of allergies, he may be switched to a soy-based or hypoallergenic formula. Always talk to your baby's doctor before you switch formulas, advises the AAFP.